Mood board: In 2017, Dior & I director Reiner Holzemer released the documentary Dries, an intimate portrait of the Belgian designer, which offered a year-spanning look into his life, and included visits to the designer’s breathtaking home and surrounding 55-acre gardens in Lier. Horticulture is a hallmark of the designer, and for A/W 2019, Noten was inspired by a renowned quote from Gertrude Stein’s 1913 poem Sacred Emily, ‘A Rose is a Rose is a Rose is a Rose’. The sentence is used to highlight that the nature of something can be denoted by just its name itself. Straight-talking and non-whimsical prints of photographs of roses from Noten’s garden populated the collection, which was a symphony of sleek pinstripe silhouettes in rich charcoal, and 1940s and 1950s couture-inspired eveningwear, including gold sequin pencil skirts, metallic chiffon blouses layered over men’s suiting, floral print column gowns and fake fur neon stoles. Best in show: Underground at the Palais de Tokyo, a long catwalk was plunged into darkness. As each model entered the space, lights in the ceiling flickered on one by one to reveal her silhouette. 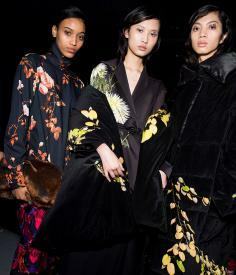 A sleek black double breasted trouser suit, paired with a sleeping bag-like stole was particularly powerful, while a satin skirt suit with a bold delphinium print was green-fingered glam.